Looking for a cozy get away? You've found it here. Wonderful year - round cottage, right in the heart of Bala, Muskoka. Access to Lake Muskoka off the dock. Moon River across the street. Sit on the patio and view either with the turn of your head. 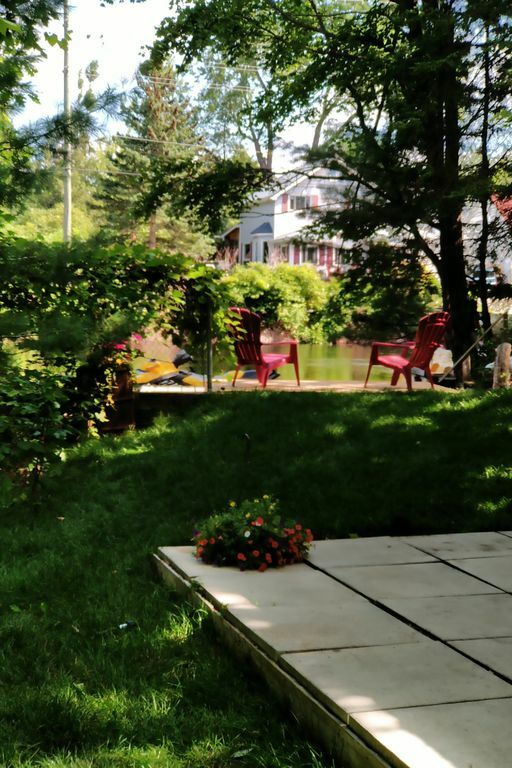 Lovely private spot within walking distance of all of Bala's amenities. One bedroom with a Queen size bed. Two double pull-out sofas. Our house rules: no parties or events, pets permitted. Well behaved pets will be permitted upon approval. Smoking is permitted outside only, please and thank you. Check In is at 4:00pm on your arrival day and Check Out is at 11:00am on your departure day. My husband and I were looking for a small place to soak in the fall for our 10 year anniversary and were really happy with our choice to stay here. Super cute, close to everything, and the owners went above and beyond to ensure that we had what we needed and were comfortable. We would definitely go back! This modest sized, well equipped cottage was clean and comfortable for our 4-day stay in early October. No need to run to the store as many essentials were thoughtfully provided. The setting is quiet with views of water in two directions. Perfect location for walking to lunch on the north side of Bala Falls or dinner across the bridge. Local residents were friendly and welcoming. Some practical details: Baseboard heat kept us warm - no drafts, WiFi was strong and reliable for streaming, shower was great - never ran out of hot water, kitchen had all the dishes, utenciles, pans we needed. Really fun place for a couple to get away to. Cozy little cottage for 2. Great outdoor area including fire pit, bbq and seating on the dock. Cute and quiet. Loved the board games, throwback movie selection and all the essentials for cooking. We liked the close walk around Bala for ice cream, a local fruit stand and LCBO. Close to a beach for swimming and a few docks for casting a line. This place is perfect for 2 who want to skip the tent as it has everything you need for a Muskoka Getaway.